He’s back! The imaginative little boy in the striped pajamas has returned…but this time he has a fever. 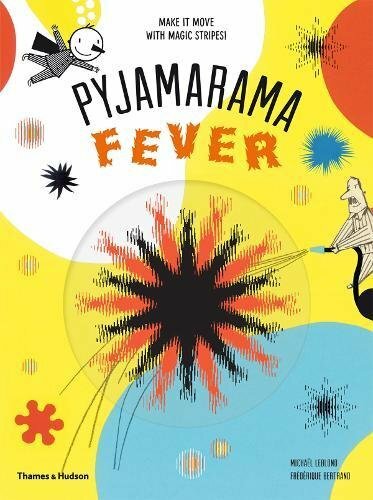 In the next installment of author/graphic designer Michael Lebond’s latest activity book, Pajamarama Fever: Make it Move With Magic Stripes, our adventurous little tour guide goes to bed feeling feverish. His fever causes him to have wild dreams that are brought to even wilder life by extracting the stripey plastic screen from the cover and moving it side to side across the illustrations. He flies past a world where everything is shimmering and spinning, and then a place where everything is rattling and clattering. As young readers slide the stripey plastic across these pages, they get to see first hand what the feverish little MC is experiencing: objects that twist and bend and shake and pop! There is even a page where everything goes “boom-boom, boom-boom,” and readers soon discover that this is actually the sound of his little heart beating in response to the fever. Other pages include the feeling of falling (that isn’t so scary, after all), and the scrambled feeling inside the brain when the fever spikes. All the pages make for an educational journey that introduces young people to the connection between fever and ddreams. This book may be even more creative than its predecessor because it doesn’t just “move,” it introduces young children to fevers and feeling bad without the fear that usually goes along with it. Young children can use the MC’s experiences to gauge their own reactions to fever. Plus, by reading how the MC makes sure to tell Mom and Dad that he isn’t feeling well, young children are inspired to explain their own symptoms to their parents.